Description: From 1 to 3 feet tall. The sheathing, Shell like spathe, mottled and verying in color from green to purple brown, envelops the heavy rounded spadix, on which are borne flowers containing both stamens and pistils. 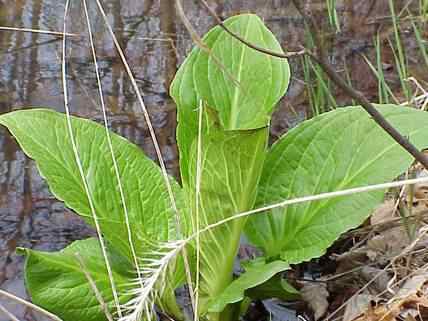 The broad leaves, which appear after the flower are at the first coiled, later become very large and have a foetid oder when crushed, hence the name skunk cabbage.